Sheep and goat rearing is a traditional occupation of small, marginal farmers and landless labourers in semiarid, arid, hilly and mountain regions of the country, inhospitable to conventional crop cultivation. Small ruminants produce food and fibre at relatively low cost from feed materials from land that often cannot be used for conventional crop production. Higher production efficiency of the two species is not only due to their ability to sustain on sparse vegetation of degraded rangeland and efficient utilization of top feed resources but also early puberty, short gestation period, high prolificacy, rapid growth rate, quality meat, milk and carpet wool production and good marketability. Small ruminants are primarily raised on grazing resources under extensive range management in different parts of the country. They are exposed to wide range of stresses under field existence mainly thermal, nutritional, exercise, management, disease, predation etc. These stresses redistribute the body resources including protein and energy at the cost of decreased growth, reproduction, production and health. 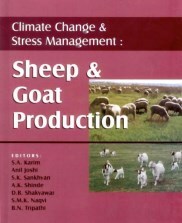 In prevailing situation of progressive shrinkage of grazing resources, under nourishment, climate change reflected in low precipitation, feed and water scarcity, inhumane transportation, handling and slaughter practices, frequent drought and famine, long distance migration, poor en route shelter, early disposal of lambs and distress sale of animals are some of the important issues causing stresses on the small ruminants and affecting their productions.